This guest from this episode is the ambassador of the dubstep sound in North America, dubstep DJ, and DJ that plays dubstep among other styles, Joe Nice. 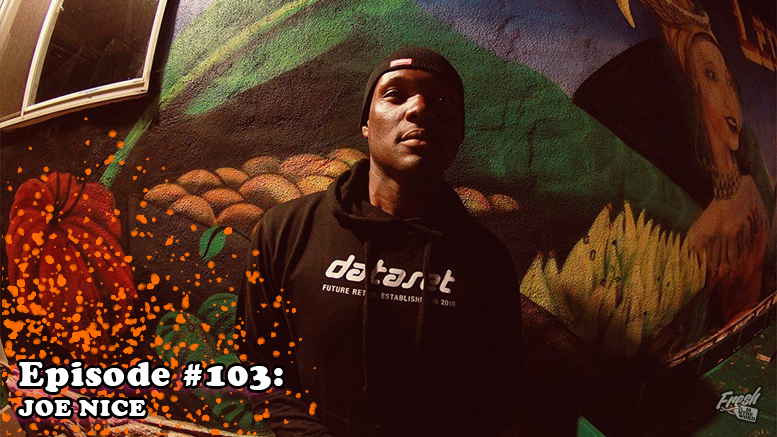 As suggested by previous Fresh is the Word guest Sinistarr in episode #90 (and we show Sinistarr all the praise he deserves at the start of the show), Joe Nice gives us a history lesson in his role in bringing the original UK dubstep sound over to North America. Joe Nice has stories and we get a taste of that in this episode and so much more. We definitely need Joe Nice on the show again to tell more stories. Each episode, the guest is asked to suggest someone from their life/career that should be on Fresh is the Word that would have good stories to tell. Joe Nice chose three people: New York-based DJ, producer, label head, radio host, promoter, and cultural curator Anna Morgan, DJ, Bass Coast Music Festival’s co-founder, and music curator Andrea Graham aka The Librarian, and one of Joe Nice’s best friends, Dave Q. This episode pick is the 14th installment of the Systems series from Critical Music, this time pairing together the MC Fox and producers Sam Binga and Foreign Concept for the Simmer Down EP. The release includes four speaker shattered riddims that will get any system shaking and moving. Easily a favorite of mine this year and a must listen.